My first favorite thing is something I admit to having a love-fear relationship with. It's the Kuhn Rikon Sandwich Knife. I ordered this knife after seeing it demonstrated, of all places, on QVC. Remember those 1980's infomercials for Ginsu knives where they saw through everything including aluminum cans with the knife and then slice a tomato cleanly with the same knife? This knife is the Ginsu's crazy cousin who invents things in the basement. 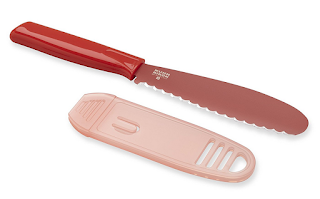 I love how this knife has a large paddle shape on one side that just begs to be dipped into a jar of mayo to spread on your bread and a nice sharp blade for not only slicing the sandwich in half when you're done but also for prepping vegetables and fixings that will go in your sandwich.